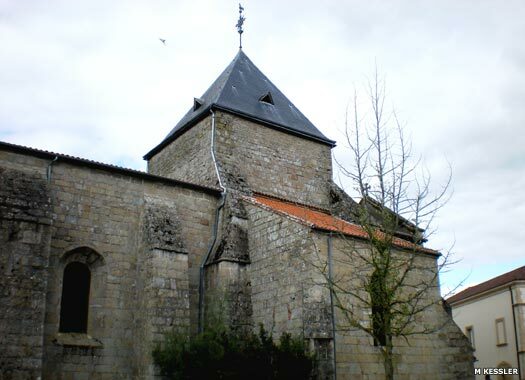 Église de Saint-Léger (the Church of St Léger) is in the town of Bessines sur Gartempe in Haute-Vienne, at the northern end of the Bellac arrondissement. The pretty market town holds a flower market every Sunday morning on the main square just in front of the church. 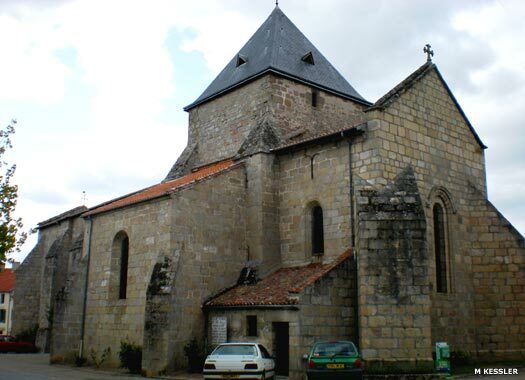 Its name comes from the Frankish 'Besinat', which means the 'Bessines neighbours', possibly because it is on the left bank of the Gartempe, and was close to the border of the Burgundian kingdom. 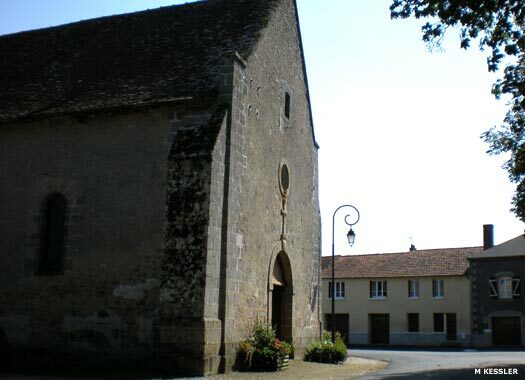 The Romanesque church was built in the twelfth century. One of its little features is the presence of a rock engraved in the eleventh century, with a design on its north face which represents a hand blessing, the origin of which is still unknown. The church was largely rebuilt in the fifteenth century, at which time the north chapel was reserved for the lords of Monisme. At the nearby manor at the Croix du Breuil King Henry IV of France came to hunt and sleep on 28 October 1605. At the end of the eighteenth century, when the French Revolution began, the church had 1,500 communicants out of a local population of about 2,000. This included 500 people from the nearby hamlet of Morterolles, which has been formally united with the town since 1982. At this time the cure was held by the religious order of Saint John of Jerusalem, and the church housed a large crucifix which had originally been used by the Knights Templars. Église de Fromental (Fromental Church), which contains a magnificent stained glass window, seems not to carry a dedication. 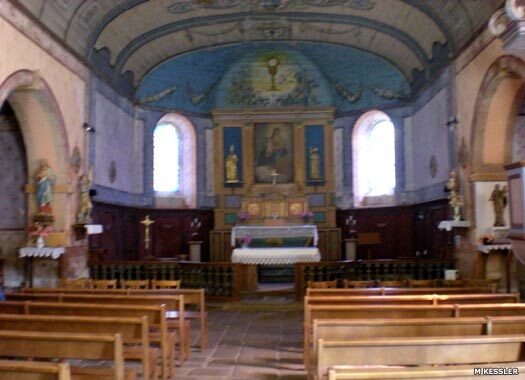 It lies at the heart of the small village of Fromental, in the arrondissemont of Guéret, just six kilometres (four miles) north of Bessines sur Gartempe, deep in the Limousin countryside. 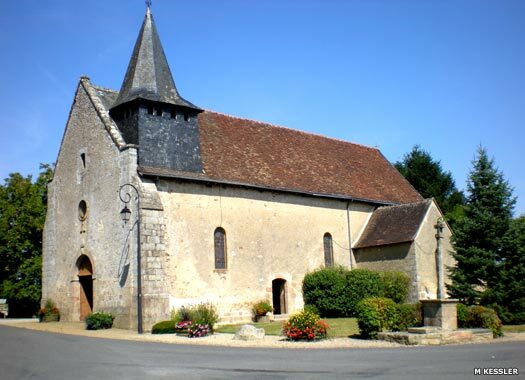 It is a village of less than 500 inhabitants and the church lies alongside the Château de Fromental, a fourteenth century fortified manor which is now an hotel. Limousin passed to the Plantagenets in 1162 through the marriage of Eleanor of Aquitaine to Henry II, future king of England. Therefore, the region was subject to English authority which became involved in the religious and artistic development of Limousin. 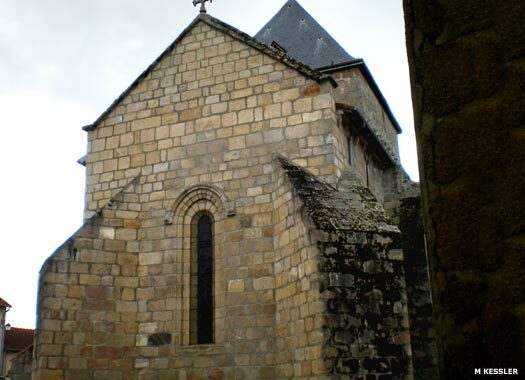 Thanks to this, the still-young Order of Grandmont which had been founded by St Stephen of Muret was able to spread throughout the Plantagenet lands, north to England and south to the Pyrenees. The Hundred Years War brought great misery and a period of serious economic decline to Limousin. 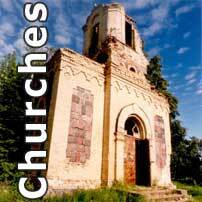 Many cities and countless villages were looted by bands of brigands or armed French or English soldiers. For this reason the Episcopal city of Limoges, which had rallied to the youthful king of France, was sacked in September 1370 by troops of the Black Prince who was fighting for the English retention of the French crown which had been inherited by Henry VI of England.